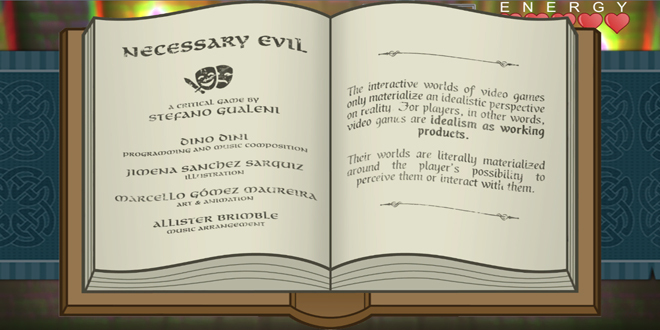 In the first part of this essay, I will discuss NECESSARY EVIL (Gualeni et al., 2013), an experimental videogame that I designed as a self-reflexive virtual artifact. With the objective of clarifying the philosophical aspirations of self-reflexive videogames – and in order to understand how those aspirations can be practically pursued – I will dissect and examine the design decisions that contributed to the qualities of NECESSARY EVIL as an example of “playable philosophy”. Taking off from the perspectives on self-reflexive videogames offered in the first part of the essay, the second half will focus on virtual worlds as viable mediators of philosophical thought more in general. In this section, I will argue that, both through the practice of game design and through the interactive experiences of virtual worlds, twenty-first century philosophers have the possibility to challenge the often-unquestioned understanding of written discourse as the only context in which philosophical thought can emerge and be developed. The videogame discussed in this essay is freely available at http://evil.gua-le-ni.com/. Self-reflexive videogames are videogames that are deliberately designed to materialize, through their gameplay and their aesthetic qualities, critical and/or satirical perspectives on the ways in which videogames themselves are designed, played, sold, manipulated, experienced, and understood as social objects. The subversion of representational and/or interactive canons, and the often jeering meta-representation of (video)ludic objects are design strategies that are frequently employed in the realization of such videogames. Self-reflexive video games typically question their own (generic) technical, interactive, and thematic conventions by intentionally provoking a sense of unease and unfamiliarity in their players and spectators. From this perspective, they can be recognized as aspiring to produce experiential effects that are conceptually comparable to those pursued by some of the currents of the philosophical and artistic movement customarily labeled modernism. The bizarre and unfamiliar aesthetics embraced by several modernist currents explicitly attempted to unsettle the observer, the reader, the spectator, the player, and to elicit in them a state of detached, suspicious inquiry. This state of mind was recognized and sought-after by the Dadaists, the surrealists, and the situationists among others as the necessary pre-condition for demystifying representational as well as cultural conventions, and ultimately for reforming society (Laxton, 2003; Flanagan, 2009, pp. 88-94; Gualeni, 2015a, pp. 63–67; Van Roessel, 2008, pp. 44-45). A few, particularly noteworthy examples are in this sense Bertolt Brecht’s epic theatre, Alexander M. Rodchenko’s works of photomontage and photography, Lev Tolstoy’s literary production, and the practice of Surrealist play. In a similar way, the aesthetic and interactive experiences of self-reflexive videogames are designed with the overt intention of establishing – through astonishment and unfamiliarity – a degree of analytical distance between players and videogames, turning the latter (embraced together with their established conventions and tropes) into objects of critical analysis. As Brecht phrased it, the spectators (or, in this case, the players of self-reflexive videogames) “need to develop that detached eye with which the great Galileo observed a swinging chandelier” (Brecht, 1964, p. 192). With those objectives in mind, these kinds of unsettling videogames typically disclose experiences that are not inherently enjoyable or rewarding. In analogy with Brecht’s epic theatre, their gameplay tends to be uncouth and drily instrumental to their experiential and critical goals. Self-reflexive videogames do not generally employ interactive and aesthetic techniques that try to make their players identify with the playing characters, unless with the intention of pulling that empathetic rug from under the players’ feet later in the gameplay. In this sense, they are not typically designed to elicit a sense of catharsis in the Aristotelian sense – that is to say to trigger “the purging of the emotions through empathy with the stirring fate of the hero” (Benjamin, 1999, p. 147). Subverting conventions and making grotesque mockeries out of traditional tropes, self-reflexive videogames prompt us to become aware of the ways in which we currently play, design, develop, sell, modify, criticize, and attribute social values to videogames and videogame elements. This seditious approach to game design is pursued by self-reflexive videogames to the extent that, if we were to try to identify their “gameness” in terms of formal properties, many would barely be recognizable as games at all. It is not infrequent for them to be roughly executed, short-lived, unwinnable, and deliberately annoying 1. In the pursuit of subversion and defamiliarization, the gameplay of self-reflexive titles often includes the overt exhibition of the “constructedness” of videogames as artifacts (for example displaying debug information or background geometry, deliberately triggering aesthetic glitches, and making elements of how a game engine triggers scripted actions visible). Instead of excluding the artificiality and the technical setup of videogames from their gameplay (removing them, or keeping them only accessible to the game developers), those aspects are frequently and purposefully exposed. Particularly evident examples of this design strategy for unsettling the players are encountered in the recent videogames releases The Beginner’s Guide (Everything Unlimited Ltd., 2015) and The Magic Circle (Question, 2015) , in which design decisions and technical solutions are aesthetically revealed during gameplay and are openly discussed by in-game characters (including the narrator) as a key feature of their gameplay. In the sense explained above, The Beginner’s Guide, The Magic Circle, and NECESSARY EVIL (discussed and analyzed in the upcoming sections of this essay) be considered examples of games with evident self-reflexive traits and objectives. NECESSARY EVIL is a small, single-player, experimental videogame that was developed by Dino Dini, Marcello Gómez Maureira, Jimena Sánchez Sarquiz, Allister Brimble and myself during the summer of 2013. NECESSARY EVIL was designed with the intention of revealing to its players – through its aesthetics and gameplay – that the ways in which we conceptualize, design, and develop videogames all rely on an implicit player-centric ideology. According to this ideological framework, the virtual worlds of videogames and digital simulations are typically produced and presented in ways that allow for a specific way of revealing: a way of disclosing an experience that is exclusively limited to the perspective of the player(s). Technically speaking, every virtual world tacitly materializes what could be identified as an idealistic perspective. According to a radical version of idealism – for example in the case of George Berkeley’s subjective idealism – the qualities that we can experientially encounter in objects (regardless of whether they are part of the actual world or of a virtual one) are not objective properties of those objects. From an idealistic standpoint, it is our experience of those objects that is responsible for bringing them and their properties into existence as mental contents (Gualeni, 2015a, p. 88). This idealistic foundations of the ways in which we technically materialize virtual worlds has, first and foremost, the functional scope of limiting the amount of calculations that are needed to sustain that virtual world. It is a convenient – if not necessary – evil. NECESSARY EVIL was designed and developed with the intention of playfully problematizing the unquestioned idealistic structuring of virtual worlds that was outlined in the previous section of this essay. In doing so, it also inevitably ridicules the player-centrism of videogame worlds, thus functioning as a self-reflexive videogame. making the destabilized (and destabilizing) aspects of the game emerge with particular evidence by way of contrast; that is to say by making in-game elements and behaviors stand out as unexpected and uncanny against the backdrop of the bulk of notions and conventions that the players are considered to be already largely accustomed to. In order to function as a critical artifact, as already explained, the game relies on its players’ familiarity with the ludo-narrative structures that the game mockingly discloses 3. Consequently, a large portion of the gameplay of NECESSARY EVIL aligns to traditional canons and functions accordingly. On the backdrop of that conventional background, and in order to demystify the player-centric approach outlined above, the game crucially subverts a specific interaction trope: it gives the player control over a contributory character. 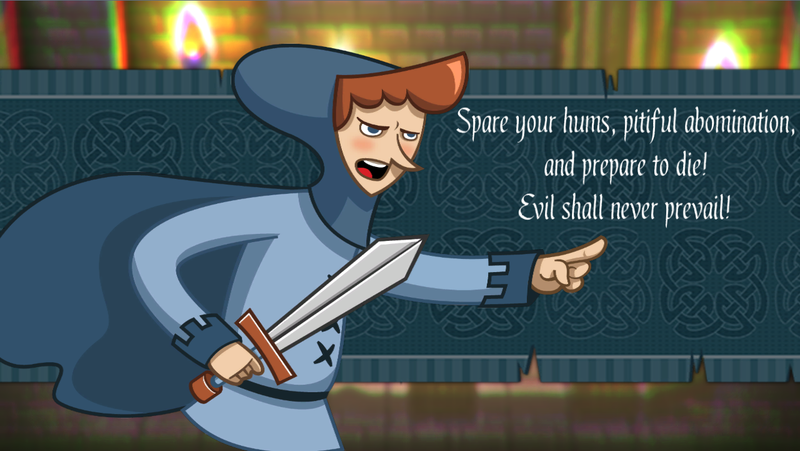 In NECESSARY EVIL, the player takes the role of a disposable minion of evil instead of the customary part of the valiant hero, a paragon of valor. In line with the aesthetic canons of action role-playing videogames, the players are supposed to recognize the minion of evil that they control as a generic, minor figure: a secondary character that plays a subaltern role in the progress of the main character – the hero. In NECESSARY EVIL, the hero is a computer-controlled non-player character (NPC) (see figure 2). Figure 1: In NECESSARY EVIL, the player’s interactions with the environment are functionally pointless; the little horned minion of evil controlled by the player cannot trigger any useful interactions with the room or escape from it. In our self-reflexive videogame, the horned minion controlled by the players is confined in a dimly-lit room from which it cannot escape (see figure 1). The monster has, in fact, no constructive options for interacting with the room: the door does not open for its little red paws, the chest contains nothing, and the objects that are already in the room respond to the players’ actions as if they were cheap theatrical props. These design decisions were meant to elicit a sense of marginality in the players, and to experientially reveal to them what a virtual world feels like when that world is designed around someone else’s perceptions, needs, and narrative progress. In other words, the players’ possibility for interaction with the world of NECESSARY EVIL, as well as the duration and the quality of their experience, are deliberately designed to be deficient and unsatisfactory (Gualeni, 2015b). Figure 2: In NECESSARY EVIL, the hero is an outspoken and relentless non-player character whose objective is to vanquish evil; he will attack the monstrous player-character instantly and without apparent reasons. As a consequence of what was just discussed, the virtual world of NECESSARY EVIL is likely to be understood by the players as existing only to be experienced by the NPC-hero, and not to be enjoyed or explored by the horned monster. The little monster merely poses a challenge among many others: it is something for the hero to overcome in order to continue on his intrepid quest. Eventually, the computer-controlled hero accidentally enters the room where the monster is trapped. As expected in these videoludic situations, a fight ensues between good and evil. 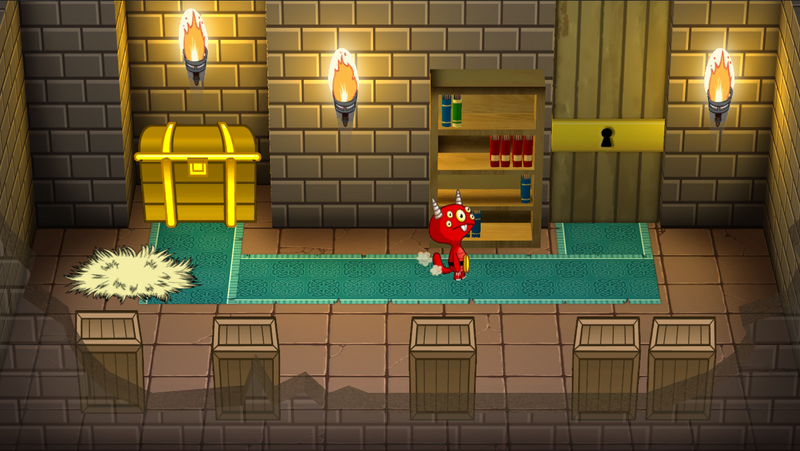 After the fight, when the horned monster is finally slain, the computer-controlled hero collects a key from the chest, opens the door, and leaves the room 4. At that point, the room itself, its elements, and the player-creature are swiftly removed from the computer’s memory, which consists – from the point of view of the monster – in witnessing the “de-rezzing” and disappearance of the game-world. This concluding act is symmetrical to the loading process that the players experienced at the beginning of the game. Both the beginning and the end of NECESSARY EVIL try to metaphorically communicate the players the constructedness of the game as a technical artifact: the de-allocation of elements and characters is needed to save memory and computation resources in order to efficiently materialize the rooms that are (implicitly) going to be visited next by the hero. Through the defamiliarization of aesthetic and interactive conventions – and thus by encouraging players to see the videogames “anew” and recognize them as possible objects of analysis and/or satire 5 – self-reflexive videogames perform specific critical functions in our culture. As cultural artifacts and as mediators of thought, they disclose perspectives and notions that are often tacitly and unwittingly excluded from practices and theories concerning virtual worlds and videogames. Similarly, as discussed and exemplified in the first part of this essay, the social agenda of several modernist currents relied precisely on the conviction that the self-reflexivity of expressive media forms (or, more generally artistic techniques and design strategies meant to make mediated content feel astonishing and unfamiliar) could foster a state of suspicious inquiry imbued with critical potential. The modernists deemed this state to be to be capable of insinuating alternative possibilities of being and promoting change at the broader socio-cultural level. The question I am tackling in this section of my essay, however, is not whether the self-reflexivity of mediated content can effectively be understood as a factor of socio-cultural change. In the specific context of game studies, in fact, the notion that virtual worlds could be embraced as interactive arguments, as academic output, and as critical artifacts has been firmly established since at least a decade ago (depending on the origin myth one decides to embrace in that respect) (Bogost, 2007; Bogost, 2011; Grace, 2014). Contemporary culture already recognizes virtual worlds of videogames and digital simulations as viable and often desirable alternatives to traditional media forms. This is particularly evident in contexts such as education, persuasion, and training. The question I am asking in this second part of my essay is whether those worlds, both in their self-reflexive qualities and inherently as worlds, can be understood as philosophical artifacts. I believe this question can be fruitfully asked – and perhaps even answered – from the standpoint according to which the central modus operandi of philosophy consists in guiding thought to rigorously reflect on the correctness and the possibilities of thought itself. In pursuing this task, the philosophers of language dedicate their academic efforts assessing the validity and correctness of linguistic propositions. Their perspectives rely on the idea that language holds a privileged – if not throughout exclusive – relationship with thinking. In academic fields like philosophy of language and psychology, the two are often conflated (Petocz, 1999, pp. 186-188). To be sure, approaches and models that are founded in some form of identification between thought and language are not only common to philosophy of language or psychology: in contemporary philosophy of mind, for example, the understanding of mental states (such as beliefs, desires, etc.) as propositional attitudes is often accompanied by the belief that such states are thereby linguistic (Petocz, 1999, p. 186). Since Plato, for reasons that are rooted in socio-technological context of fifth-century Greece, the history of philosophy has been specifically identified with the history of a particular declination of a linguistic approach to philosophy: written philosophy. Interestingly, these reasons also started to be explicitly discussed in some of Plato’s own texts, for example in the The Seventh Letter or in the Socratic dialogue Phaedrus. One of the first twentieth century philosophers to advocate for a critical attitude towards the exclusive and often unquestioned association between thinking and writing was Ludwig Wittgenstein. However, apart from a few remarkable exceptions (among which Wittgenstein’s own 1929 Tractatus Logico-Philosophicus and Jacques Derrida’s 1974 Glas), philosophical texts have rarely supported and complemented their perspectives and arguments by means of their physical design and/or editorial structure. Hardly ever has philosophy materially expressed reflections on its very materiality 6. The enduring and exclusive focus on linguistic ways (and, in particular, on written ways) of mediating thought can be understood from this perspective as having numbed the sensitivity of Western philosophy towards the specificities and the limitations through which that specific form of mediation frames and sequences arguments and ideas. I believe that it can also be accused of having made philosophers poorly capable of entertaining the possibility of alternative methods for mediating philosophical thought. This almost complete eclipse of philosophy’s critical attitude towards the medium-exclusivity and the viability of alternative ways of mediating thought (and thinking) is what the second part of this essay tries to challenge in the age of digital media. Having recognized the inherent limitations and effects of linguistic ways of framing and communicating thought, it would be illogical to propose to embrace building as the ultimate philosophical medium. The use of virtual media 7 or other forms of practical involvement as ways to pursue philosophical thought through doing can intuitively be understood as overcoming some of the inadequacies and limitations that are inherent to an exclusively linguistic – or more specifically textual – mediation of thought. It is, however, a form of overcoming that inevitably brings about new philosophical problems, limitations, and discontents. The embedding of videogames and computer simulations in social practices (philosophy being one of them) might, thus, best be pursued on the basis of the understanding that, as with any other forms of mediation, their virtual worlds disclose reality in specific ways, and that such ways are always inherently both revealing and concealing (Gualeni, 2015a, p. 94). New ways of establishing relationships with reality through media necessarily entail a balance between the increase in acuity of certain cognitive functions and the desensitization of others (McLuhan, 1994). In this essay, and in the larger context of my philosophical work, I do not argue that the design and experience of virtual worlds should be understood as exceptional – or even as particularly desirable forms of “doing” philosophy. What I am proposing is, instead, that more scholarly efforts are devoted to developing both critical attitudes and sustained curiosity towards the possibilities and limitations offered by our larger technological environment to philosophy. To put it more practically, I am advocating for a more flexible and inclusive approach to the mediation of philosophical thought. From this standpoint, various and heterogeneous technical and expressive forms could be employed and combined to achieve the desired representational, persuasive, experiential, communicative, reflexive, and critical effects. Their synergic use could, I argue, potentially limit the emergence of biases relative to specific media forms and could complement and counterbalance the specific disadvantages inherent to each form. Going back to the specific point I am trying to make, I believe it is important to observe that interactive virtual worlds might not be particularly suitable for presenting abstract philosophical concepts in their full intricacy and subtlety. Similarly, traditional written discourse can be recognized as limited and partial in its unsuitability to grant the recipient of a philosophical notion or argument direct experiential engagement with the notions and points of view that it mediates or the possibility to negotiate its premises and outcomes. These last possibilities are typically offered, instead, by virtual media. In this sense, there are several philosophical practices and arguments that could benefit by the hybridization with media forms that, for example, rely on simulation instead or representation as the dominant mode of the organization of cultural objects. We could, for instance, utilize virtual worlds in combination with textual explanations in philosophical contexts when detailed representations of spatial contexts are particularly salient to the point being made, or when the materialization of a specific situation is called for (for example in the case of thought experiments or the simulation of speculative ethical scenarios). Virtual media could be phenomenologically and rhetorically advantageous when the recipients of a certain philosophical notion or perspective are expected to objectively test and evaluate different possible courses of action, or are confronted with interrogatives concerning non-actual or non-human phenomenologies, etc. For a more detailed and thorough discussion on the philosophical relevance of embracing the design and the experiences of virtual worlds, please refer to chapters 4, 5, and 6 of my 2015 book Virtual Worlds and Philosophical Tools. In NECESSARY EVIL, as a case in point, the philosophical arguments of the game are not only offered to the player in the form of an interactive experience, but is also summarized textually in the pages of a (simulated) book that can be encountered in the game world (see figure 3). Figure 3: The argument brought forward by NECESSARY EVIL can be interactively experienced in the virtual world that the game discloses, but can also be accessed in textual form. One of the books in the grubby library that furnishes the room contains a written summary of its key philosophical proposition. Following a reflection on self-reflexivity in videogames, this essay advocated for a less intransigent approach to the articulation, the manipulation and the diffusion of philosophical ideas, notions, and hypotheses. In the preceding pages I proposed a more compromissory approach to thinking, an approach that is open to embrace – where contextually desirable – the hybridization (or even the substitution) of traditional media forms with activities that involve doing and/or experiencing something (within as well as without digital mediation). In developing my arguments, I did not only present a linguistic speculation on philosophical mediation, but combined philosophical text with philosophical gameplay within a virtual world. I would like to conclude with the observation that the framing, communicating, and problematizing of philosophical thought through virtual worlds will constitute, for twenty-first century philosophers, a challenge that goes beyond problematizing the exclusive use of written discourse. Philosophizing with (and through) virtual worlds will not simply consist in reframing and reformulating classical philosophical questions and perspectives, but already led to the inevitable emerging of new ways of thinking as well as new philosophical interrogatives. Such questions are often only possible to be articulated as – and/or within – virtual worlds and often reflect on their very digital mediation. I am referring, for example, to philosophical approaches to personal identities in cyberspace, to embodiment and mental dissociation in virtual worlds, to the ontological status of the virtual, to self-reflexivity in simulated worlds, to the our moral horizon in relation with artificial intelligences and virtual beings, to the relationships between actual-world policies and the ones that are enforced in virtual worlds, et cetera. It is in from this standpoint that I argue that virtual worlds need to be understood, studied, and used as the contexts in which a new humanism has already begun to arise. Wanna play? van Binsbergen, W. (1997). Virtuality as a Key Concept in the Study of Globalisation. Den Haag, The Netherlands: WOTRO. Bogost, I. (2007). Persuasive Games: the expressive power of video-game. Cambridge, MA: MIT Press. Bogost, I. (2011). How to Do Things with Videogames. Minneapolis, MN: University of Minnesota Press. Bogost, I. (2012). Alien Phenomenology, or What it’s Like to Be a Thing. Minneapolis, MN: University of Minnesota Press. Brecht, B. (1964). Brecht on Theatre. The Development of an Aesthetic. London, UK: Methuen. Flanagan, M. (2009). Critical Play: Radical Game Design. Cambridge, MA: MIT Press. Gold, M.K. (Ed.). (2012). Debates in the Digital Humanities. Minneapolis, MN: University of Minnesota Press. Gualeni, S. (2015a). Virtual Worlds as Philosophical Tools: How to Philosophize with a Digital Hammer. Basingstoke, UK: Palgrave Macmillan. Gualeni, S. (2015b). Playing with Puzzling Philosophical Problems. In N. Zagalo & P. Branco (Eds.) Creativity in the Digital Age (pp. 59-74). London, UK: Springer-Verlag. Kittler, F. (2011). Towards an Ontology of Media. Theory, Culture & Society, 26 (2–3), pp. 23–31. Lévy, P. (1998). Qu’est que le Virtuel? Paris: La Découverte. McLuhan, M. (1964). Understanding Media: The Extensions of Man. Cambridge, MA: MIT Press. NECESSARY EVIL, Gualeni, Dini, Gomez Maureira, et al., 2013. Petocz, A. (1999). Freud, Psychoanalysis, and Symbolism. Cambridge, UK: Cambridge University Press. Pound, E. (1934). Make it New – Essays by Ezra Pound. New York, NY: New Directions. Rayner, T. (2007). Foucault’s Heidegger: Philosophy and Transformative Experience. London, UK: Bloomsbury Academic. van Roessel, L. (2008). Re-staging the Epic. Brechtian epic elements in computer games and their use for computer game literacy education (unpublished MA thesis, Utrecht University). Retrieved from http://dspace.library.uu.nl/handle/1874/32324. Shklovsky, V. (1917). Art as Technique. In L.T. Lemon & M.J. Reis (Eds.) (1965) Russian Formalist Criticism: Four Essays. Lincoln, NE: University of Nebraska. The Beginner’s Guide, Everything Unlimited Ltd., 2015. The Magic Circle, Question, 2015.